Why should your learning end just because you completed a course? It shouldn’t and we at the CommScope Infrastructure Academy don’t think so either. Following the launch of the new online SYSTIMAX Installation and Maintenance course for our PartnerPRO Network, we decided to put more training in your pocket so you can take it with you. 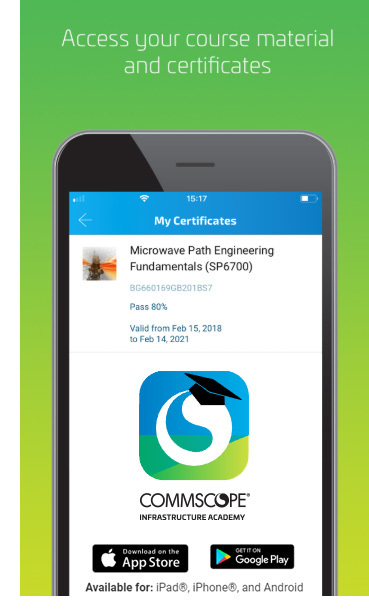 The CommScope Infrastructure Academy app is now available for members of the PartnerPRO Network because education should never stop. The new app, available for iOS and Android devices, allows students to access a large library of demonstration videos, interactive product demonstrations, instructional documents and other information. All this material is available on a student’s smartphone or tablet where ever they are and can even be saved to their device so it can be accessed when offline. The app also brings a change in how we provide badges and certificates for certain certifications. It’s a safe bet that students have their phones with them wherever they go. So, we decided to make badges and certifications available on the same device. From now on, we will no longer produce and send physical badges or certificates. Recognizing the qualifications of cabling designers and installers is more important than ever. We believe it should be regarded as a key compliance requirement, both on and offsite. CLICK TO TWEET: Your education should never stop. The CommScope Infrastructure Academy app is now available for members of the PartnerPRO Network. We also encourage our students to take screen grabs of the latest certificates and share them with us on social media using the hashtag #InfrastructureAcademy. Accordingly, the CommScope Infrastructure Academy issues qualifying students with training certificates and unique photo ID badges for the relevant training course. Customers should and have come to expect a number of certified badge-holders to be involved in projects. The certified disciplines including any specializations that the badge-holder attained, are depicted by the logos that appear on their badges. The SYSTIMAX online training accreditation and badge program is a global program that clearly differentiates the world-class expertise of CommScope alumni. Connect with others: Connect with colleagues, industry experts and fellow students by using our discussion board, allowing you to keep up to date with CommScope product news. Updates and notifications: Receive updates about your training, such as when a certificate is due for renewal, and industry-related news direct to your device, with instant notifications. Choice of languages: The Academy has a global audience, so we have designed the app for that diverse community. All content within the app is available in 16 different languages. We believe the new app comes with some great features, but we are already looking ahead to adding additional features and tools in the future We will be sure to communicate any updates as work progresses. Click here to download your copy of the app today. What other features would you like to see on the app? Use the comment section below.